7 years ago, the first Asus Crosshair IV was introduced. 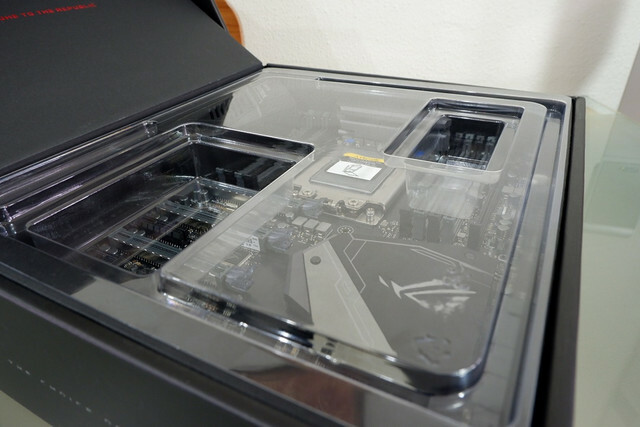 A couple of months later, Asus launched it's very first "Extreme" series called the Asus Crosshair IV Extreme. Back then AMD never release any HEDT CPUs to the market. This year AMD rise out from the ashes and decided to enter into the HEDT segment, where Intel had dominated the HEDT segment for a long time. Hence Ryzen Threadripper was introduced. 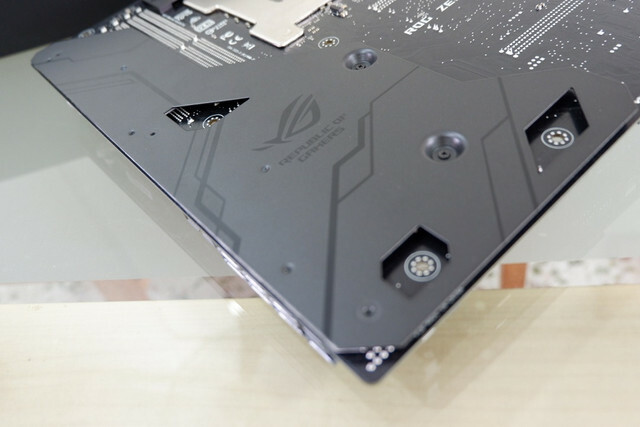 And out from no where, Asus shows off the top of the line X399 Zenith Extreme motherboard for Threadripper earlier this year in Taiwan Computex. This is a little odd as Asus usually do not start from the "Extreme" series. And indeed this is by far the best motherboard that Asus has ever created for AMD Threadripper. It is a good opportunity for me to share with you guys the Asus X399 ROG Zenith Extreme together with the 1950X. Lets start of with the unboxing. The very first thing that came to my mind was the weight of the overall package. It is so heavy! I admit, this is by far the heaviest unboxing i have ever done for a motherboard. Lets see what goodies have Asus packed inside for users later on. Moving to the rear of the box, there is a ton of brief features available. 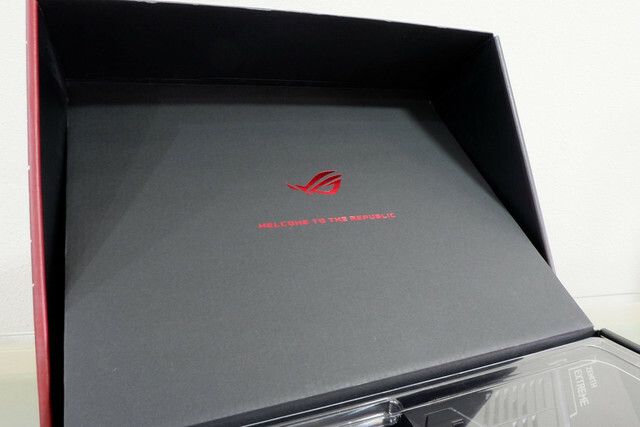 Lifting up the front flap reveals a nice welcome from Asus. Motherboard are well packed in place. 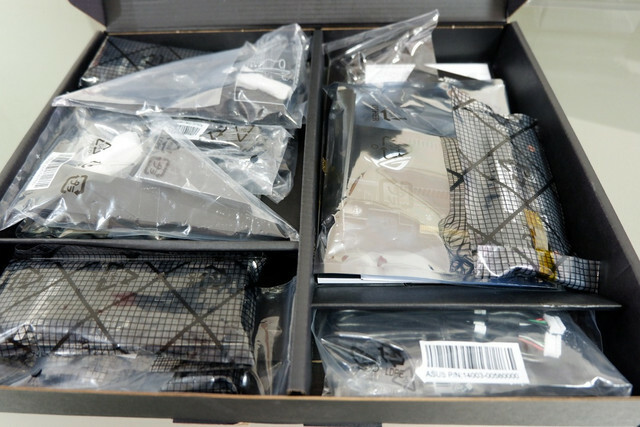 Below the motherboard packaging would be the accessories box. 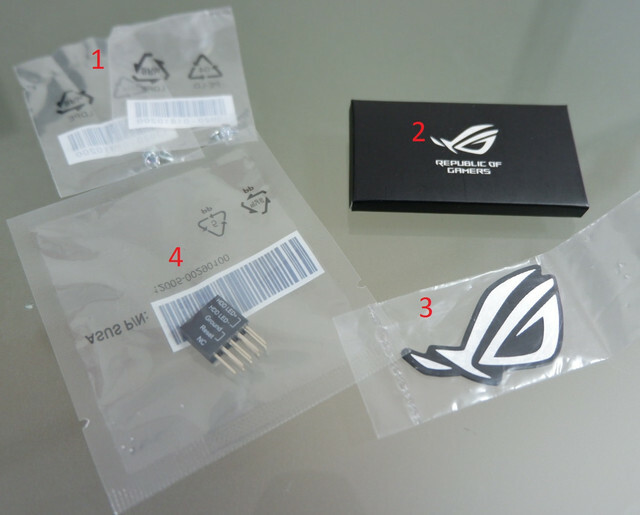 The very first time when i lifted up the packaging flap, i'm overwhelmed by the accessories provided by Asus. Lets go through in batches. All right the boring stuffs first. 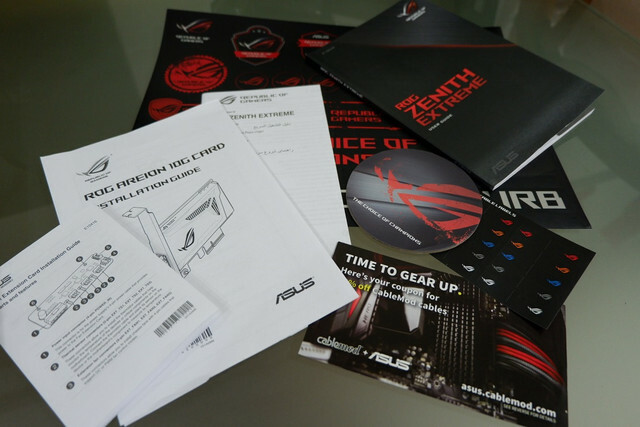 There is a lot of manuals, user guides, installation guides for the Fan Extension and the ROG Areion 10G card. There are a lot of stickers, cable labels, cup coasters and a nice 20% discount from Cablemod. 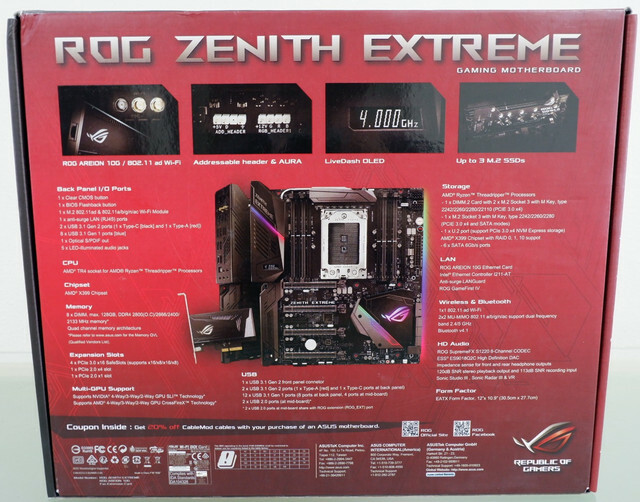 There is a Fan Extension Card that can be hooked up with the motherboard ROG extension that can be found at the bottom of the motherboard (A pic of it later on). It comes with a "L" shape bracket together with some screws, this allow users to mount the Fan Extension Card on any mounting holes that you have. In the manual, they have mentioned that it can be mounted at the 5.25" bay screw mounting points. But in my opinion, i don't think it is a nice recommendation as there aren't much modern cases that comes with a 5.25" bay. Personally, i would route this Fan Extension Card to the back of the case and mount it on any available holes. grpocz, Mikiberry, shiroyuki03 and 2 others like this. Last edited by royfrosty; 20-08-2017 at 12:27 PM..
2x WiFi antenna with flexible wires. This supports 1x1 802.11 ad WiFi and 2x2 MU-MIMO 802.11 a/b/g/n/ac dual frequency band 2.4Ghz and 5Ghz band. Oh and it supports Bluetooth 4.1 to. This is another interesting freebies, the ROG Areion 10G Ethernet card. 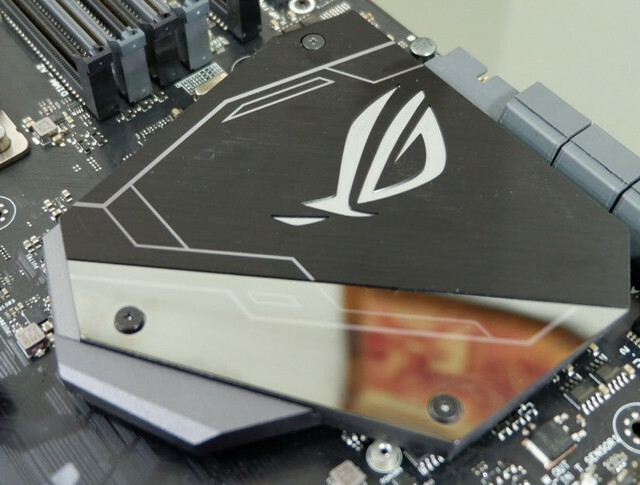 This is by far the most expensive thing that Asus has ever provided. Nice beefy heatsink attached. *Please note that by adding this card your internet will not "upgrade" and give you 10Gbps. You will need a few other 10Gbps equipment and a 10Gbps internet subscription from your ISP in order for this to work. 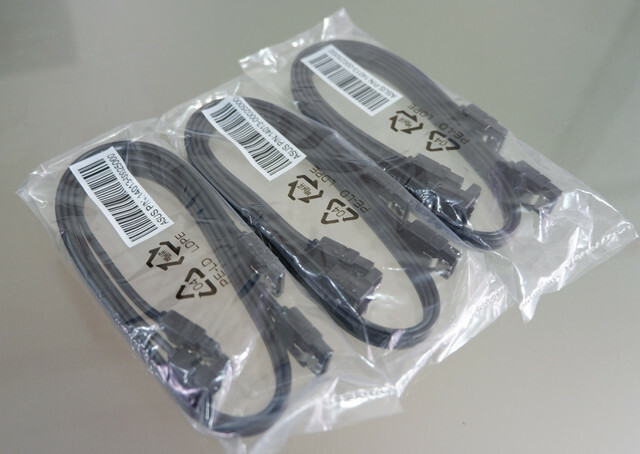 It comes with 3x right angle SATA cables and 3x straight SATA cables. Sadly no U.2 cables provided. 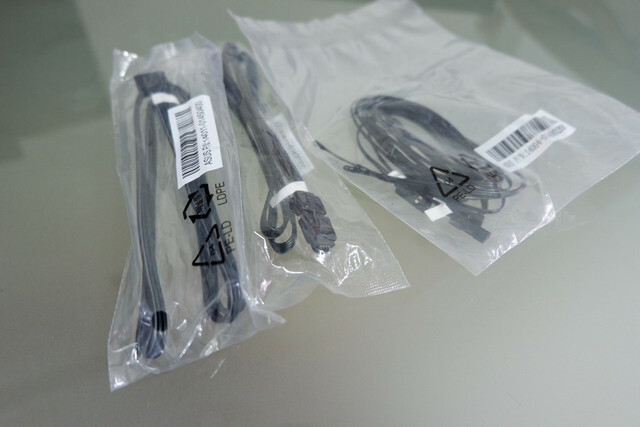 Asus did provide 2x RGB extension cable, 1 of them is for the addressable LED, while the other is for Asus Aura. Asus did provide some thermal probe for temperature sensing. M.2 lovers gonna love this. This is the ROG DIMM.2 card. It supports 2 M.2 PCIE SSD that goes into a DIMM slot found on the pic below. 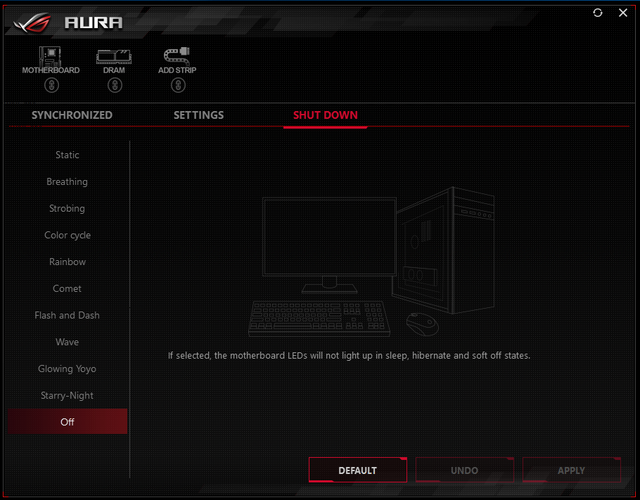 This feature was originally introduced in the Z270 Apex motherboard. 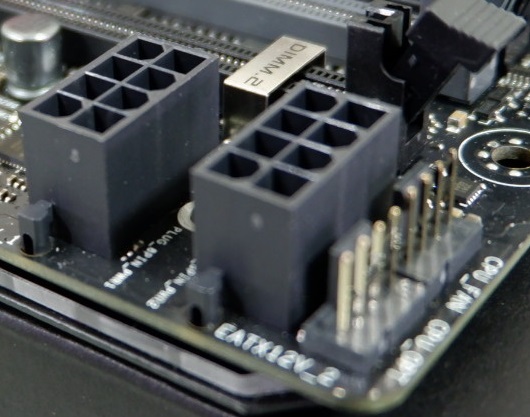 This allow users to make use of RAM coolers in order to cool the M.2 SSDs. Of cause there is no relations between DIMM bandwidth with this. This DIMM.2 is connected directly to X4 PCIE lanes for each individual M.2 slots. Giving you full speed for those looking for maximum speed without compromising thermals. 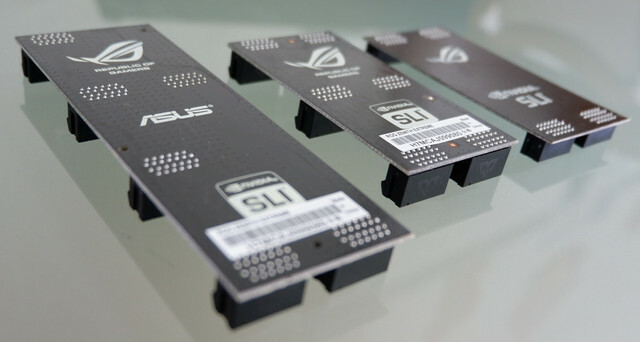 Another interesting that Asus has thought of providing is a GPU retention bracket. Since nowadays GPUs are pretty heavy with its beefy heatsink, this will actually help to prevent the GPU from sagging further. This is great news. Probably gonna use it on my personal rig when this board arrives. 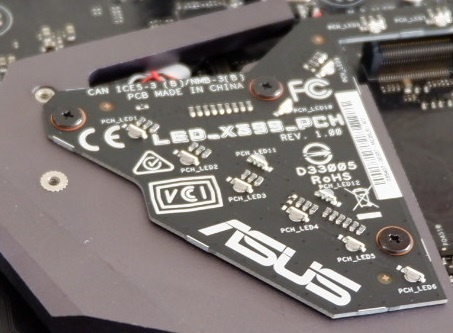 You are not seeing triplets, yes Asus provided not 1, not 2 but 3 freaking HB SLI bridges. It comes in 2 way SLI, 3 way SLI and 4 way SLI bridges. Though they are not fanciful, but that is the thoughts that counts. Good job! Among these accessories, i really love the USB thumbdrive. This is good and a smart move by Asus. Hardly there are any users using the optical drive these days, yet alone most modern cases does not provide a 5.25" bay. I hope other brands starts to take their initiative to implement USB thumbdrives rather than CDs. Last edited by royfrosty; 20-08-2017 at 12:14 PM..
As usual, i would start from the top left corner of the motherboard, and going round it. 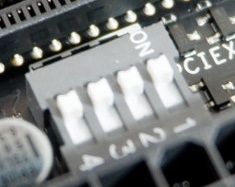 At the top right corner of the motherboard, there is a dual 8pins for CPU power. 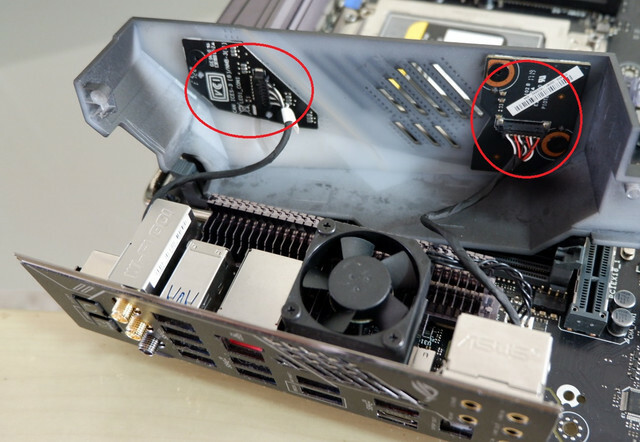 Just beside the 24pins EATX power, there is a dip switch for PCIE ceasefire. This is good for troubleshooting purposes. 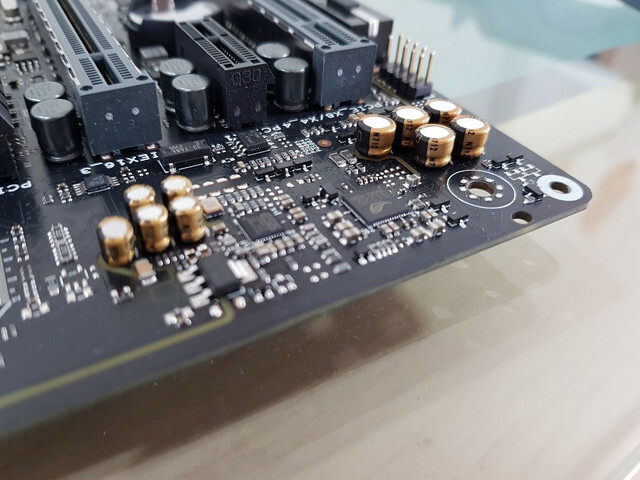 Such as they allow user on LN2 or people with custom water cooling GPU that are unable to plug out for troubleshooting can opt to turn off the PCIE communications for troubleshooting purposes. Glorious 8+ (1 DIMM.2) slots. Lets take a closer look on those nice 8+2 power phases. 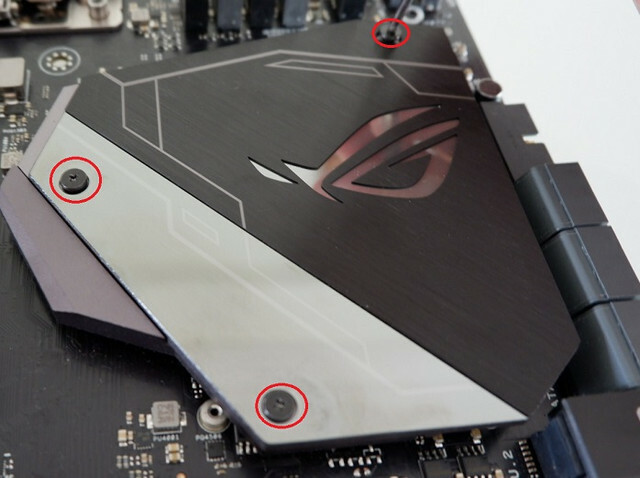 First you would need to remove the shroud, just flip to the back of the motherboard and unscrew those screws marked in red circle below. Sorry it is very difficult to take a pic on the VRMS, it is too tiny and a little too dark to take a picture of it. It is done by International Rectifier 3555M. 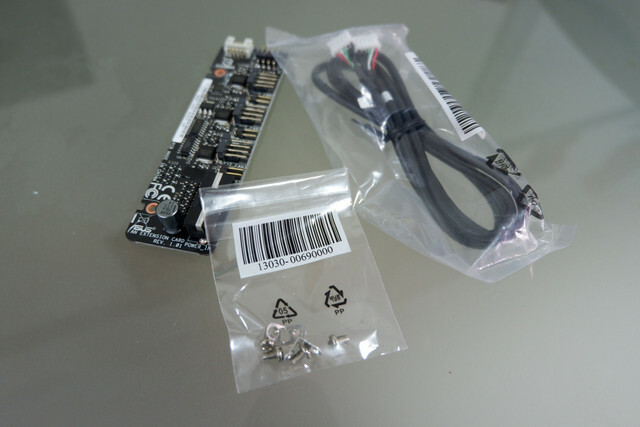 This can deliver a total of 60A and Asus provided a total of 8 of it, that is 480A of output current. That's a lot for Threadripper. Last edited by royfrosty; 20-08-2017 at 02:15 PM..
Moving to the bottom of the right RAM slots, a large PCH cooler. This is another good implementation, Asus double up with another M.2 cooler and PCH cooler together. So yes, the Zenith supports up to 3 M.2 SSDs, and best of all, all are being either actively cooled or passively cooled. The gloss mirror finishing are meant for running LEDs. To gain access to the last M.2 slot, remove the 3 screws that are marked in circle below. Once removed, you will noticed there is another thermal pad attached to the bottom of the PCH heatsink. Remove it before usage. There is a PCH LED that gives the nice LED fuse display for the PCH heatsink. Just beside the heatsink there is the M.2 slot, yes it is link to another X4 PCIE lanes. Last edited by royfrosty; 20-08-2017 at 04:27 PM.. 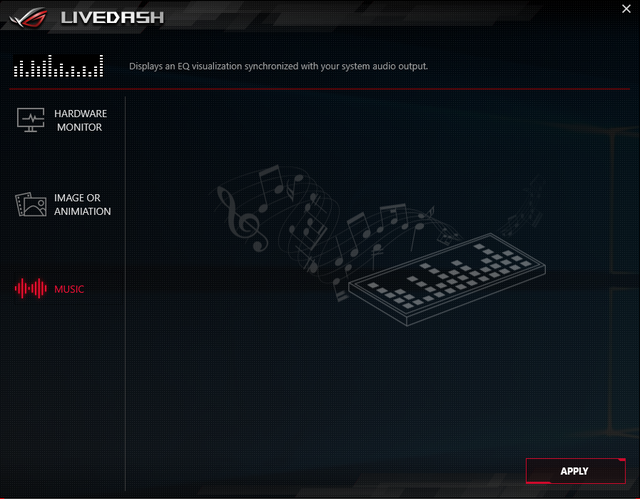 This is an interesting segment, Asus opted for a Sabre DAC together with the their S1220 Codec. Their DAC is capable of reaching -115dB THD+N, derived from the ESS Hyperstream DAC architecture. 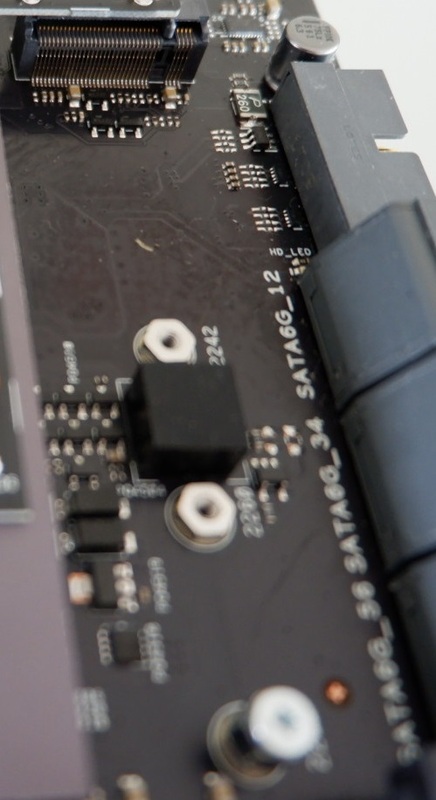 A closer look at the Sabre 9018Q2C DAC and the audio Codec. LANGuard together with the Asmedia USB controller found under the rear IO shroud. Moving on to the PCIE slots. All full length PCIE slots are reinforced with steel, it is known as the Steel Safe slots. Now the thing is that, they have added a x4 PCIE slot, which i find it useful as this allow users to add in the X4 10G Aerion Ethernet card or a x4 M.2 PCIE adapter. Here are the PCIE lane allocation. * Please note that if you attached in a PCIE device at the bottom PCIE 6, your U.2 port will be disabled. 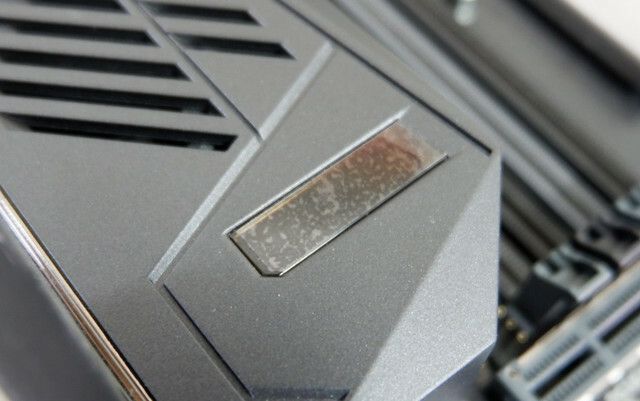 Now the rear IO, this is not like the X370 Crosshair VI/Extreme. 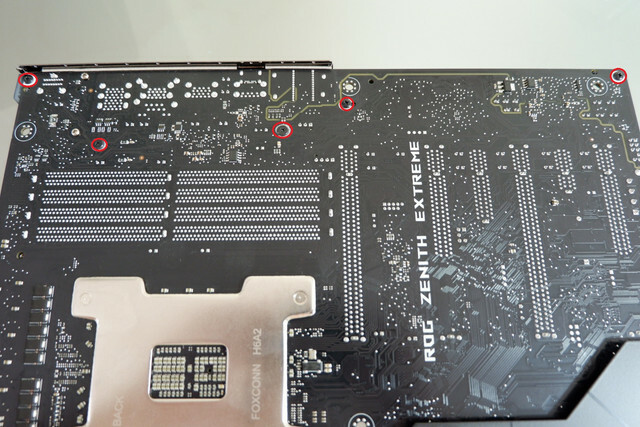 The Zenith has lesser IO than the X370 Crosshair. They actually make way for the exhaust holes, this is for the active cooling VRM fan to exhaust out the hot air. But any way, it should be more than enough. As you guys noticed, the board is kind of thick? It is 2017, RGB is being the trend these days, and yes they added a motherboard RGB backlit. 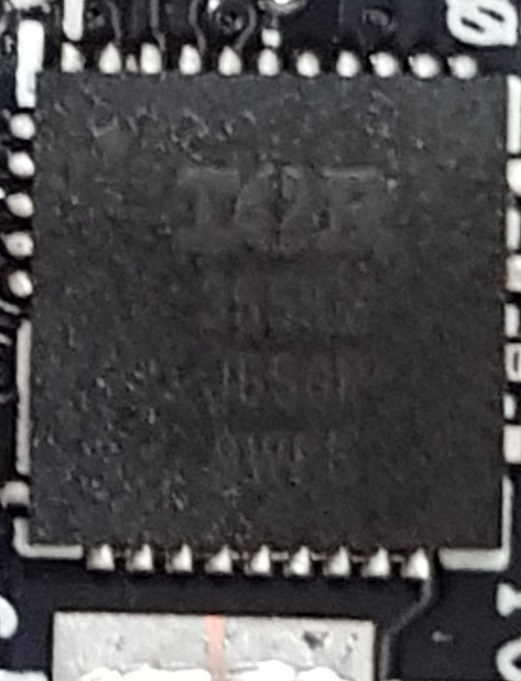 It is found at in between the backplate and the motherboard PCB. Adding strength to it by reinforcing it together. *LED stripped marked in yellow. Last but not least, yes this board does not have a 7 segment display for debugging code. Instead they opted for a OLED display instead. They allow users to see the debugging code on it and also allow users to custom made their names to be appeared on the Live OLED display. Pretty neat? I think so to. Last edited by royfrosty; 20-08-2017 at 05:36 PM..
A quick glance of the BIOS, it looks exactly like what you will find on a Ryzen mainstream platform. Just a little more extra features. 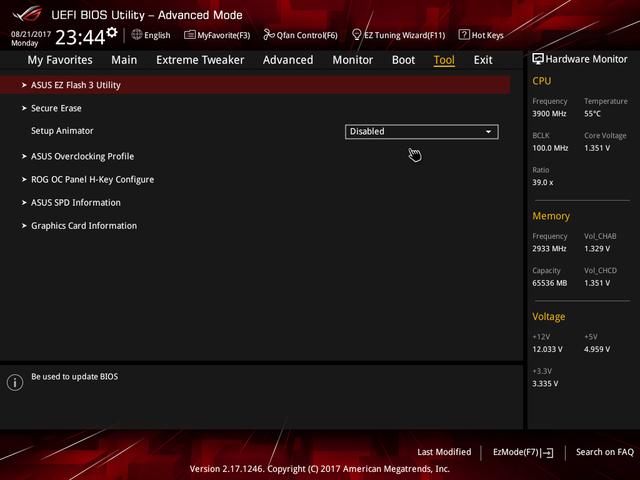 As always, the first boot up will always bring you to this EZ mode BIOS page, nothing much can be set other than RAM XMP profile and other simple tweaking like fans, and boot priority. Hit the F7 button and it will bring you to the Advanced Mode. Nothing much on the "Main" tab as it shows the motherboard info and system date and time. 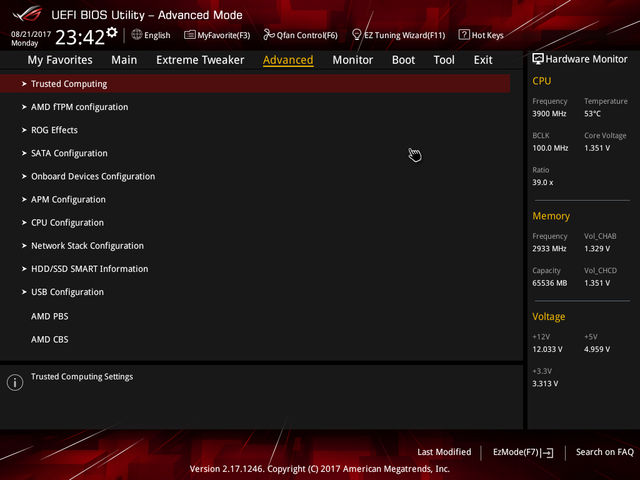 The "Extreme Tweaker" tab is where users can set overclocked CPU ratios, voltage core, DRAM frequencies, DRAM timing, DRAM voltages etc. The weird thing is that Asus actually bothered to put one 4Ghz overclocked preset setting that does nothing but change the multiplier to 40. No other settings changed, not even voltages change. Totally useless and boring. Any way nit pick stuffs. This tab allow users to set the boards configs. And yes this board allows users to do P-State overclocking. 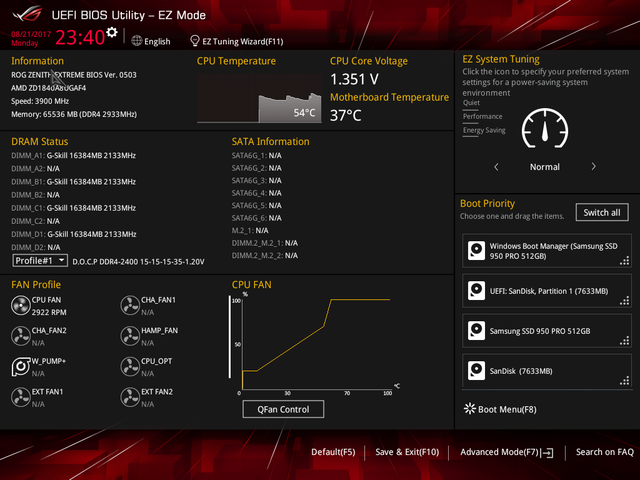 In "AMD CBS" you will see "Zen Options"
This monitoring page is one of my favourite section that allow users to monitor all the temperatures. Yes it does support temperature reading if you were to use those temperature probes. This is where users can set boot priorities and more boot configurations. This tab allows users to flash their motherboard BIOS, do Secure Erase for SSD degrading performance and save overclocking profile. Last edited by royfrosty; 22-08-2017 at 12:10 AM..
*Please note that this is a standalone benchmark/review. I'm not going to pit it against another CPU or any other motherboards. Cause i have another upcoming review doing just that. 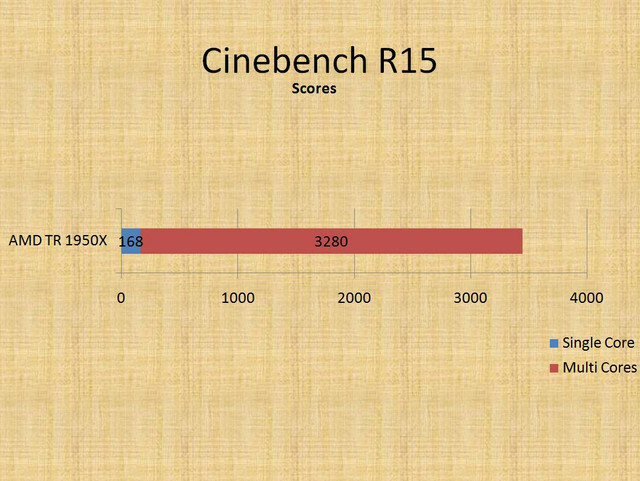 Lets start with synthetic benchmarks for Geekbench, Cinebench, Blender, 7zip, 3DMark Firestrike and Time Spy. Cinebench test scenario that uses all the system's processing power to render a photorealistic 3D scene. This makes use of various algorithms to stress the all available processor cores. 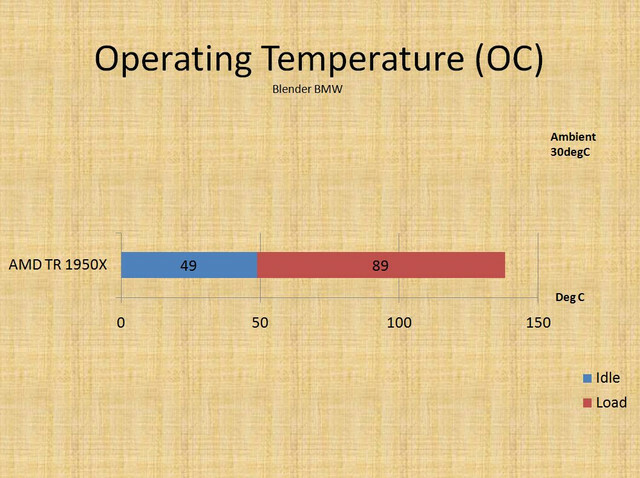 The 1950x is just a monster in this department, with an overclocked 3.9Ghz, it hit a total of 3280 scores. However in the single score department, it just managed to hit 168, which is pretty on par with all the other mainstream Ryzen CPUs. 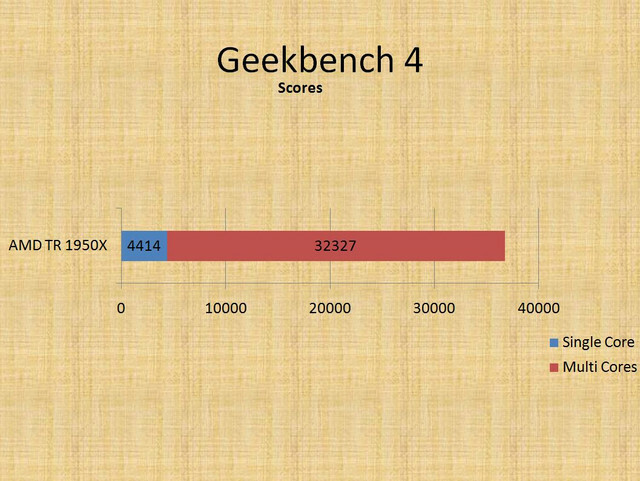 Geekbench CPU benchmark measures the performance of CPUs for everyday tasks. It simulates real-world applications and determined the total scores fore the CPU. Here we have the 1950X scored at 4414, not too shabby, but when it comes to multi cores, it just scores like a king with 32327! 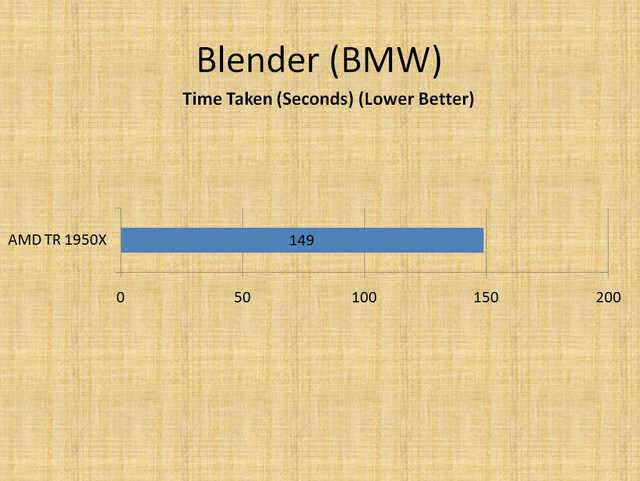 Blender is another benchmark tool for rendering. In this case, the 1950x completed it in 149secs! I wasn't expecting it would finish under 3mins, but my god, it is darn fast! LZMA is used for the lossless compression of the data. 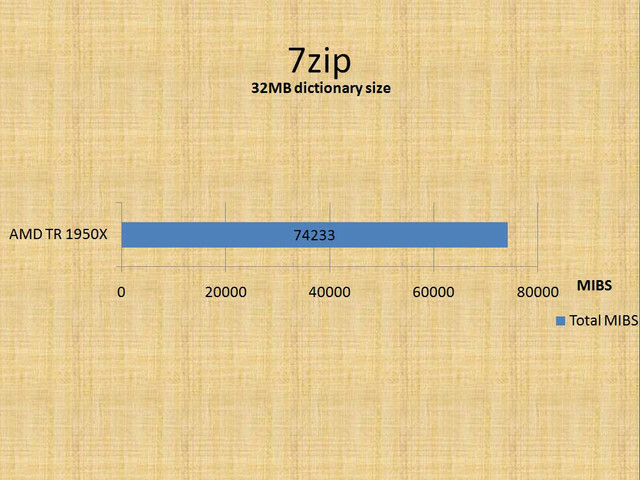 7-Zip uses some dummy data and then uses the LZMA to compress/decompress it for the benchmark. 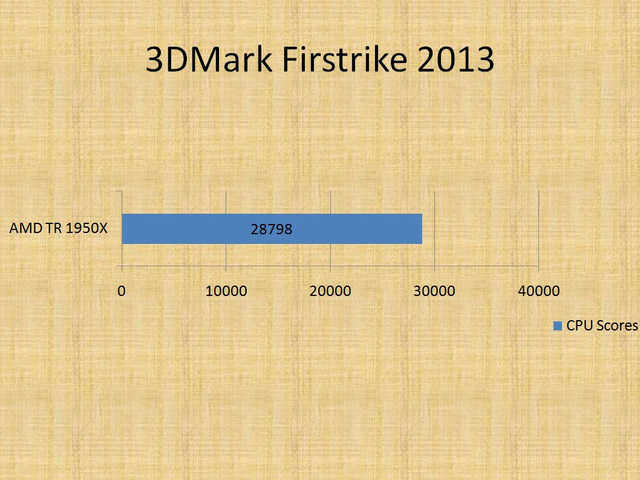 Fire Strike is a showcase DirectX 11 benchmark designed for today's high-performance gaming PCs. But we are looking more on CPU Physics scores to determine its strength of the CPU. The 1950X scored an impressive 28798 on physics CPU benchmark. 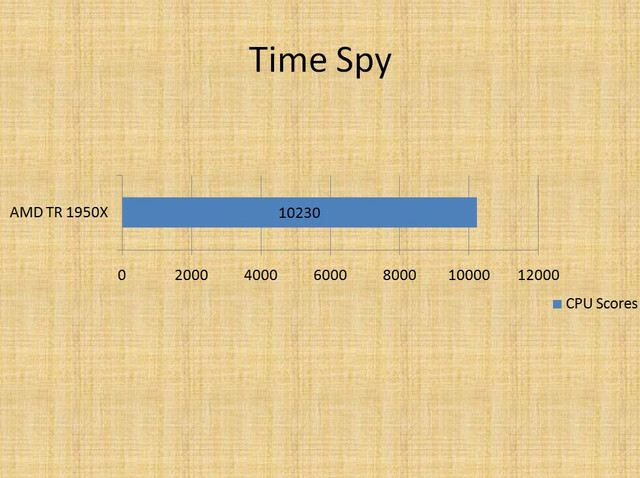 Time Spy is a benchmark tool for DX12 games. 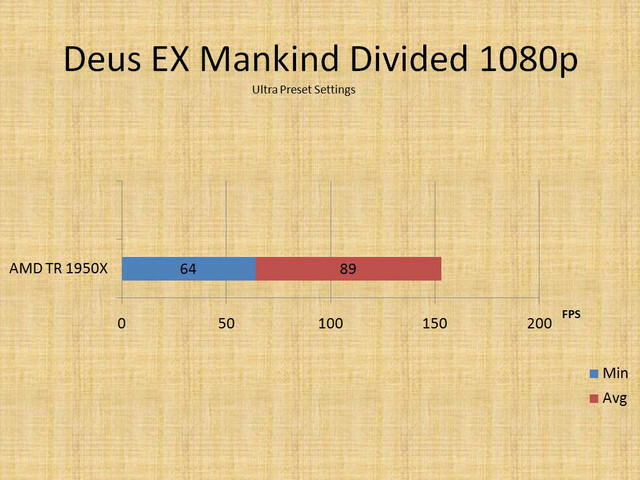 We are looking at CPU scores only, and the 1950X scored just above the 10000 mark. 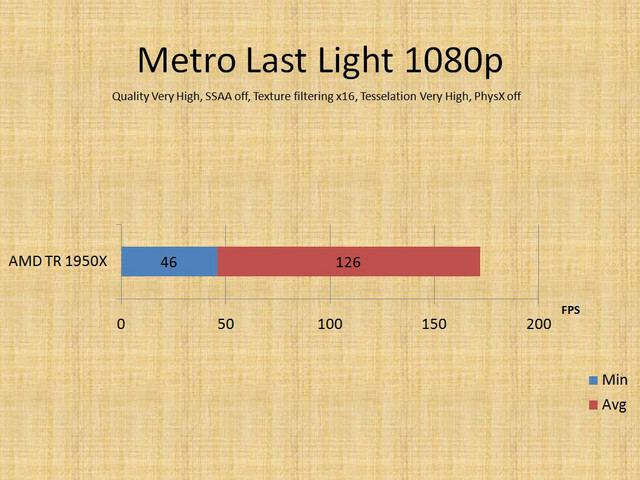 Moving on to some gaming benchmark, take note that i have set the 1950x to be on "Game Mode". What this does is that it temporarily disables half the CPU cores which turns the 1950x to a 1800x. So meaning to say, it is running at 8c16t. This is a 4+4 CCX configuration on one die. 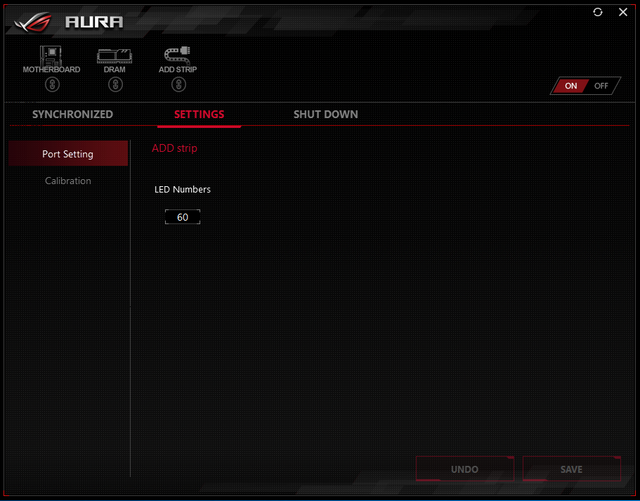 In "Game Mode" the memory access mode has changed to "Local mode" (NUMA) which helps to reduce memory latency. Why i have decided to use "Game mode"? Cause i did tried to use the default "Creators mode", but however some of the games minimum frame rates were affected and at most of the times, most of the cores were left idle or rather not utilized. Since games are not gonna run well on more than 8 cores, there is no use for 1950x to be fairly tested here. Hence i have decided to set "Game mode" on and helped to improve memory latency. Before turning on "Game mode", the minimum frame rates were strangely very low, it was running in the low-mid 40s. 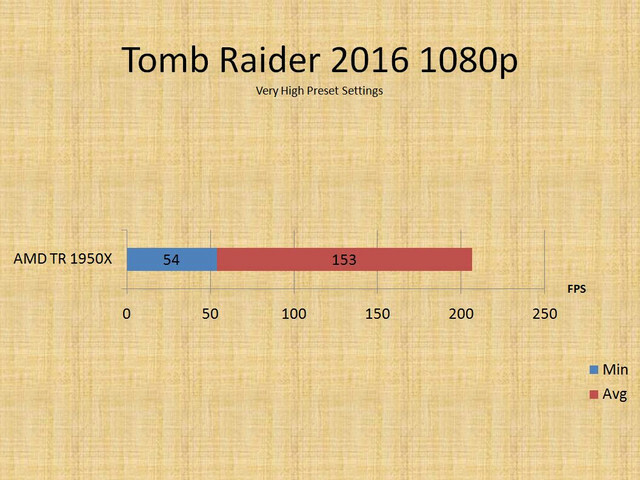 However after turning on "Gaming mode", Tomb Raider started to utilize the 8c16t well and boosted up to 18% in minimum frame rate. This title did no difference if i turn on or off the "Game mode". 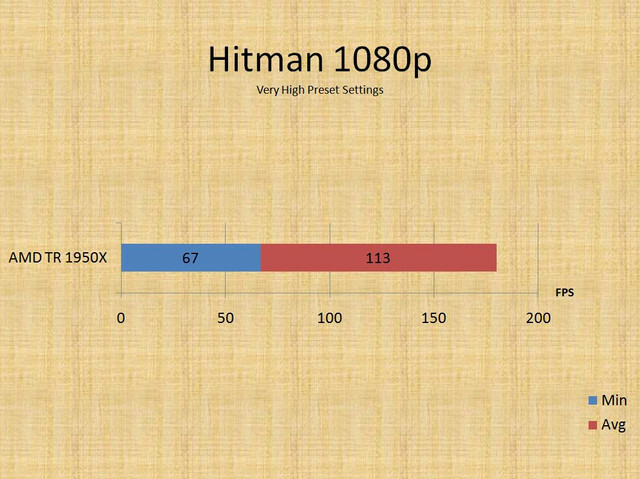 Last edited by royfrosty; 28-08-2017 at 11:00 AM..
Hitman performed just well above 67fps. Overall smooth game play. Another fairly demanding title, but no problems running above 64fps. 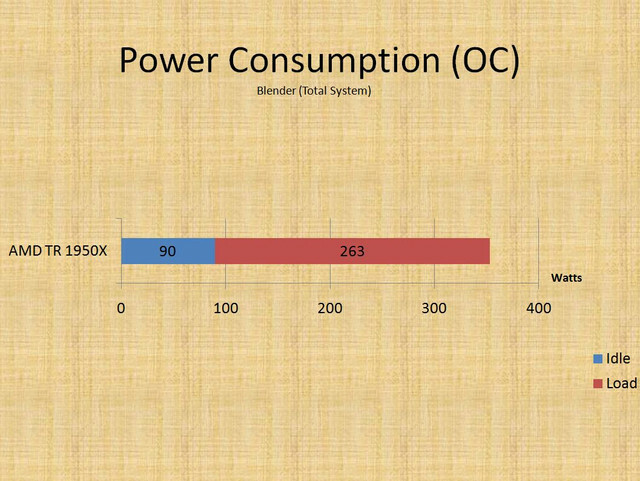 Overclocking on the 1950x would bring the power consumption fairly high, doing a blender benchmark, it managed to pull a total of 263w (Full System) off the wall. So if want wants to use these bad boy CPUs, you better get it well cooled. 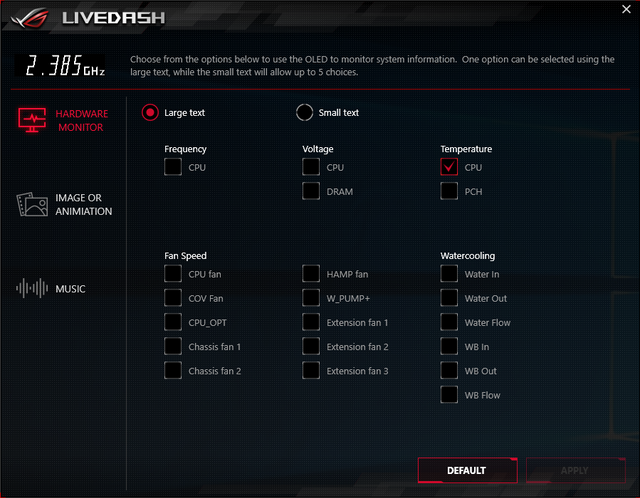 AIO cooling will be preferred instead of air cooling. As for temperature, do note that i'm using a standard TR4 stock air cooler, it has only 2 copper pipes touching both the DIES, and it is fairly enough to cool the 1950x. Hence the idle temperature hit a soaring 49degC and hit 89degC on full load. 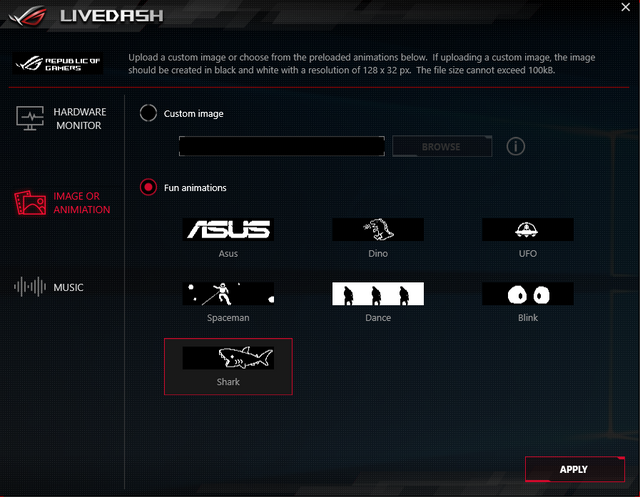 The Live Dash software is pretty interesting, but however it is far from my expectations. But indeed it is good enough for now. What is Live Dash? Basically the OLED display on the Zenith IO shroud area. It displays a few things like Hardware monitoring, Debugging Code, any black and white image, and music EQ. The bad point about displaying hardware monitoring, it does only 1 specific task. You can't choose more than one option. Only 1 at a time. I wish that they would allow users to set more than 1 monitoring and rotate the info around. Fancy a Shark animations? Or a Dino? Or perhaps your favourite custom image? Lastly for music lovers.... EQ on Live Dash. Last edited by royfrosty; 28-08-2017 at 11:21 AM.. I used to hate Asus Aura as when it first launched, it didn't really work out well. Apart from that it doesn't has that many LED features. That was from Z170 era. But however it has grown over the years and indeed it is a lot better now than before. Every single LED bulb, every single area are all customisable to your heart content. 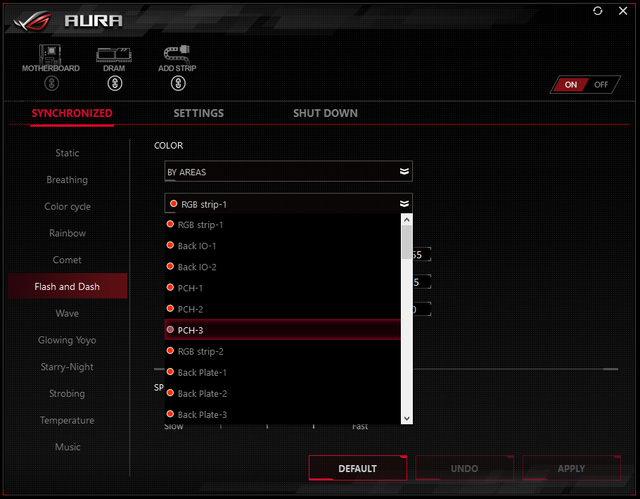 There are also port settings and calibration for your own RGB strips. And lastly to off any of the LED when it is in sleep, hibernate or off states. Last edited by royfrosty; 04-09-2017 at 02:53 PM..
Every year i personally do not agree to buy an expensive motherboard from Asus. This is partly because of the value of the motherboard and the things that they bundle inside are pretty not worth the price tag. Even as an enthusiast myself, i find it hard to justify the price paid for a high end motherboard. However that all changed today, the Asus X399 Zenith Extreme is the only board i would consider for my daily PC. Why? Cause this board has what it takes to be for my daily usage, rendering videos, photo editings and yet game at the same time. 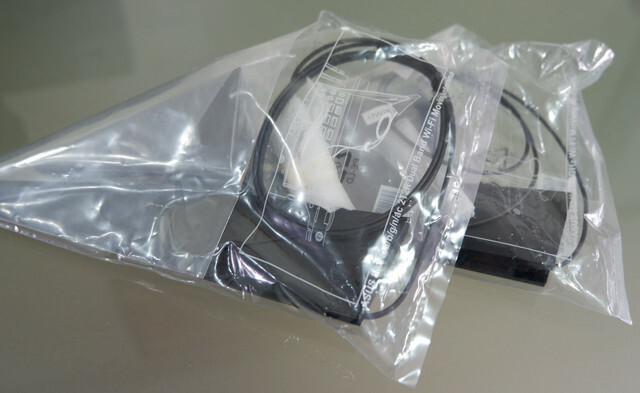 The things provided are really useful, such as the 10G network card, the GPU retention bracket, the WIFI card and antenna, cablemod coupons, the fan extensions and a few other small stuffs that do come in handy. 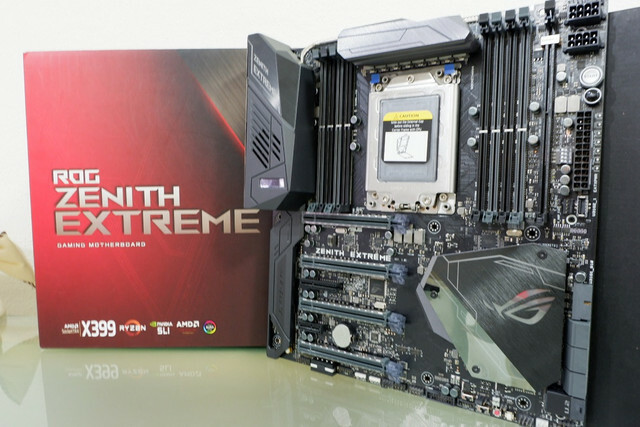 Its not easy to understand the price tag for the Asus X399 Zenith Extreme, cause not many people will buy this motherboard or rather sees the value in it. 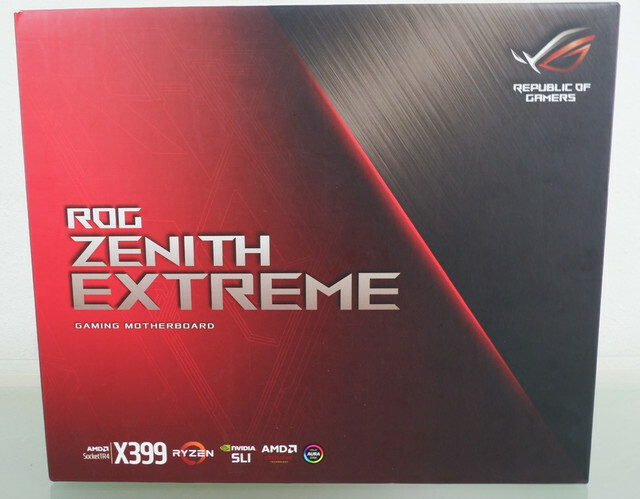 Im sure any Asus fan out there knows about the Extreme line up, back in those days over at team blue Extreme motherboards, what are they bundling inside? I don't think they have ever bundle anything inside as much as the Asus X399 Zenith Extreme. You have to be a real enthusiast to own this motherboard, to understand the cost of it and also the performance that it provides. I have personally bought the Asus X399 Zenith Extreme. Apart from the things that comes with it, the motherboard's performance, the BIOS, the overall utilities software for it are just perfect for a high end users for content creations and gamers at the same time. I can't ask for more. Performance: There is no wrong in this department, perfect 10/10. Aesthetics: The Asus X399 Zenith Extreme is just beautiful, the fact that Asus bothers to put in effort for all the running LEDs on this board, the PCH, the IO shroud, the back plate. All these are customisable through Asus AURA software, every single LED can be tuned to the colour one desires. Yet for those whom do not like LED or RGB theme, turning it off would make the motherboard looks nice and stealthy looks. So no wrong in this department either, perfect 10/10. Price/Value: Well you have to be a true enthusiast to understand the pricing of this board. Hence, this board is not for everyone, at the time of writing this review, the price of the board is at S$969 SRP. But nevertheless you are getting a lot more with this board. So for that i would minus 1 point away for pricing, nothing less. 9/10. Functionality: A lot of things are very well implemented. Integrated IO shield, DIMM.2, PCH cooler acts with M.2 cooling, active VRM cooler, a single X4 PCIE slot, OLED display. These are the things that are pretty well thought out. Yet again perfect 10/10. Total score 9.75/10 Making this the highest scoring motherboard in my list. Good job Asus. You finally won my vote for this board. clon22 and ASUS@SG like this. Last edited by royfrosty; 28-08-2017 at 12:18 PM..
too expensive already. i can buy a motherboard for $200+. Yes nothing is free in this world. Lets be frank. You can't please everyone right? There are people whom will appreciate the accessories provided, the things that are provided are pretty much useful, things like GPU retention bracket, 10Gbps networking card, DIMM.2, SLI bridges. Tell me honestly, are these items not useful to a users? Yes on the other hand users can say it is useless for them, clearly this board is not meant for those users. You may be better of buying another board that you may not have any kind of accessories. 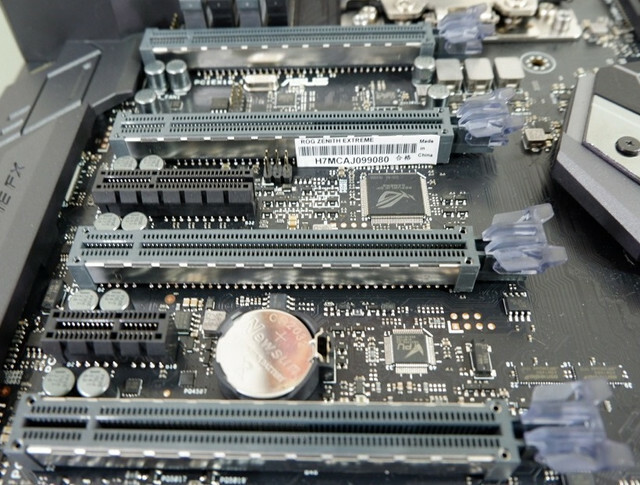 Most of the TR4 motherboard starts from $600. This board is $369 away, there is more than just the accessories provided. So yes to some it is a huge cost. To some, it is something that they want. It is those little details that this board that makes the money well spent. I used to disagree with high pricing board. But imho, this board is something that I will agree paying for. Because its something that I NEED. clon22, outrun100 and OceanEleven like this.